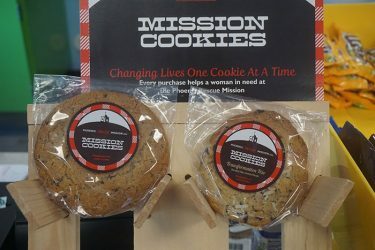 Mission Cookies raise money for the Phoenix Rescue Mission. Near the cash registers at convenience stores inside The Grid, Chaparral and Juniper is a display setup of Mission Cookies: individually wrapped cookies made in central Phoenix and shipped weekly for sale at Grand Canyon University (among other places). These cookies are made by adults learning a new vocation as part of their transition from a life of dire circumstance (homelessness, domestic violence, drug addiction) toward receiving a second (or third) lease through the Phoenix Rescue Mission. The making, baking, marketing and distribution of Mission Possible cookies is all done by Rescue Mission clients. Zach Casavant, director of marketing and communications for Sodexo and GCU Dining, said 100 percent of the approximately $700 weekly cookie sales at GCU go back to the Rescue Mission’s career transition and vocational programs for women in need. It’s not the only one. As part of required clinical rotations within several degree programs, College of Nursing and Health Care Professions students make regular trips to the Rescue Mission (among several other Valley locations) to work with transitioning adults while providing free exams, education and other health care. Thanks to curriculum changes before the start of this school year, twice-weekly rotations now last 10 weeks. But what used to be a group of 16 students per rotation is now 32 students to accommodate demand within CONHCP, increase exposure for students and further the “community care” emphasis within CONHCP. Similar partnerships are in the works between CONHCP and Circle the City, while the Phoenix Rescue Mission recently expanded its cookie operation to include weekly delivery services to campus (and beyond) when ordered through GiftCookies.com; for example, parents wish to send cookies or a care package to GCU students. A re-branding and re-packaging marketing effort is also in the works. The Phoenix Rescue Mission is one of many community partnerships with GCU, and the Mission Cookies are the most delicious.